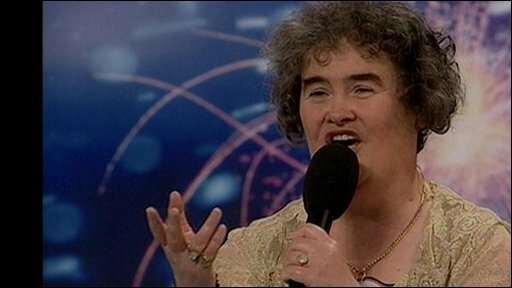 Scottish singer Susan Boyle has made it through to the live semi-finals of ITV's Britain's Got Talent, where she will battle it out with 39 other acts. The 48-year-old from West Lothian became a worldwide sensation after her audition performance of I Dreamed A Dream was screened last month. The 40 semi-finalists will perform in five nightly ITV1 shows from tonight. Other acts through include an 11-year-old street dancer, a dancing dog and a group of performing farmers. The 40 acts were announced during the latest edition of Britain's Got Talent on Saturday night. In each of the semi-finals, two acts will be picked by the public and the judges to make it through to the grand final next Saturday. They are all competing for the chance to perform at the Royal Variety Show and win a £100,000 cheque. As she was put through to the next stage, Boyle jumped for joy and said: "I am on top of the world. It's fantastic!" Her first appearance on the television talent show received more than 58 million hits on the internet site, YouTube. That earned her a number of famous fans, including rock musician Jon Bon Jovi and Demi Moore, and she was also interviewed on American television shows Oprah and Larry King since she came to worldwide attention. But she is not the only performer on the show to have caught the judges and public's attention. Ten-year-old Lancashire schoolgirl Hollie Steel also made it into the semi-finals with her performance of I Could Have Danced All Night during which she both sang and ballet-danced. And 12-year-old Shaheen Jafargholi from Swansea is tipped to rival Boyle after his performance of Who's Lovin' You prompted Demi Moore to praise him on her Twitter feed. The performance of another young semi-finalist, 11-year-old street dancer Aidan Davis, has been compared to last year's winner George Sampson making him another top contender for the final. Among the more unusual acts in the semis are three farming friends, Sam Parris, 27, Bobby Barns, 18, and Lyle Burrough, 19, all from Exeter, known as The Barrow Boys. The three farmers described their act as "everything you shouldn't do with a wheelbarrow".